It’s that time of year…the red and green butcher paper rolls are shrinking, the Grinch makes a school visit, and concerts have replaced athletics as the main evening events. The holidays offer opportunities for celebration as well as distractions. Kids get off of their routines or the classroom curriculum is not aligned with the seasonal activities and, as a result, our plans too often take a backseat to festivities or classroom challenges. I won’t get into the religious aspect of celebrating the holidays, especially in public schools (check out Teaching Tolerance for more information on this topic). Instead, I thought I would share as well as request ideas for integrating promising literacy practices during the holiday season. Service learning projects – This time of year can be stressful for some families living in poverty or just find this time of year hard. Teachers can develop extended lesson plans that involve students writing letters to individuals in assisted living centers and then hand delivering them, or creating original multimedia content to raise money for organizations in need. Learning about our culture – Why do we celebrate some holidays and not others? How does where we live influence what holidays we choose to recognize as a community? These big questions can guide students to research their traditions in order to better understand their past. What they learn can be written as a report and then presented to peers and families using a digital tool of choice. Exploring themes of the holidays – When we study a topic and look at multiple perspectives, trends and themes may present themselves. If holidays as a study are a staple in a school, it might be interesting to facilitate literary analysis and have students explore various texts to understand the larger ideas that are connected to the many known and unknown holidays. The idea of “text” can be expanded by incorporating podcasts, art, and other nonconventional mediums. I realize this post comes at the tail end of the holiday season. Yet now might be a great time to reflect on our current practices and how they might better incorporate literacy for future instructional planning. How do you authentically integrate reading, writing, language, speaking, and listening with your teaching at this time of year? Please share in the comments. As the new school year begins, I am entering my third year as an instructional coach. This year I will serve K-2 teachers at two elementary sites within our district. This is a new coaching model that our district is moving to in order for our coaching team to have a stronger focus, impact student achievement, and achieve district goals. In Jennifer Allen’s book, Becoming a Literacy Leader, she outlines some specific ways that coaches can achieve success over time. These ways include knowing our purpose, sharing the vision, and maintaining a strong focus. As our team embarks on this new coaching model, like Allen, we must ask ourselves, what is our focus and what are we willing to give up so that we can identify a small number of high-leverage moves that will help us reach our goals? One of the challenges of this kind of successful coaching is scheduling. Being able to attend every grade level meeting is not possible. Allen acknowledges this challenge and the need for structures to be in place in order to “propel the momentum of our work.” For the work to be sustainable, it cannot only be dependent on one or two people. This is where teacher leadership must be cultivated in order to fill the gaps that having only one coach can leave. Allen outlines a process that utilizes teacher leaders. This process provides a way for teachers to work and make meaning together and hold a common interpretation of the curriculum. The belief is that this raises the level of consistency in implementation of the curriculum, therefore, raising student achievement. The teacher leader facilitates the work based on what the team wants to emphasize. Two reflection templates are provided with questions for teachers to consider. What are the key understandings for the unit? What does the student know in regards to the learning goal? What are the next steps for instruction? What does the student still need to demonstrate to meet the learning goal? Are any confusions or misconceptions observed? I am excited about this process since it gives me another tool to use in helping cultivate leaders and help teachers take ownership over their grade level meetings. It’s that next step I have needed as I reflect on my previous experiences with grade level meetings. The idea of helping facilitate meetings that will give teachers direction, a shared understanding of their unit, opportunities to share effective instructional strategies, and reflect on student work with common expectations makes this coach excited to get started. Let the growing of teacher leaders begin! Every day for the past two weeks since starting my new coaching position my husband has asked me this question. Only knowing me as a classroom teacher for the past seventeen years, I think he is trying to wrap his head around what exactly it is that I do all day. I think I am too. It feels foreign to not have a group of first graders waiting for me to get there each day. I didn’t have to prepare a classroom for Meet the Teacher Day or think through how I would spend the first few days building community. It is the weirdest feeling to walk on campus each morning and realize that no one is waiting for me. This is freaking me out a bit. I have all these insecurities and questions rolling through my head. What if the teachers think I am doing nothing while they are in the trenches with kids? What if my administrator thinks I am doing nothing all day because I don’t have lesson plans written or a room full of children? What do I have to show for how my time is spent at the end of each day? I’m pretty sure that my husband keeps asking because he is worried after leaving my “safe” job that maybe if I’m not looking busy enough unemployment is just around the corner! This is why I am now holding on to, Chapter Sixteen: Nuts and Bolts-Scheduling and Budgeting, for dear life. This chapter answers and confirms that my insecurities might not be far off. That if I want to be perceived as an equal member of the school community, I have to find a tangible way to reflect the intangible things that have kept me busy and exhausted each day. That teachers ARE probably thinking, What does she do all day? Here are the things I have started working on and thinking about to keep myself accountable and to document my time so that all of those questions mentioned can be answered quickly and easily. First, I am creating an amazing literacy space for teachers and students that started out two weeks ago as a room filled with boxes of books and empty shelves. The mascot of our sweet little school is the Knights. Therefore, I decided the space where the kids and teachers will come to find books and resources needed to look and feel like a castle. It will be called, The Knight’s Nook, and children will be summoned by a princess (the head of our lower school) to come and be dubbed the Knights of the Reading Round Table (thank goodness that is the shape of the tables that got left in the room). The transformation of this space is something tangible everyone can see and the fact that we are surprising everyone with a big reveal builds anticipation and excitement around reading. This will be my first gift of literacy to the school. Second, I have made it a goal to have my schedule visible to all by the end of the second week so everyone knows where I am and what I am doing. The first few weeks I wanted to give the teacher’s time with their students to get to know them, finish assessments and build a classroom community before I inserted myself. In the meantime, I have been stopping in, offering teacher’s coverage for bathroom breaks or to refill their water bottles and reading aloud to the kids so I can begin to get to know them in my own way. I have been complimenting the amazing environments teachers have set up for students, noticing how much they know their students already and empathizing over how tough the first few weeks of school really are. This has helped teachers see that although I haven’t started my “real” job yet, I am not sitting in a room by myself doing nothing while they are in the trenches. Third, I have been collecting questions and ideas so that when I meet with my administrator we can have a specific, smart conversation about my role as the literacy coach. We can decide bottom lines, non-negotiables and where I fit. She will be able to see through these questions and observations how I have been spending the last few weeks-knee deep in observation and reflection to help decide next steps. Finally, I am going to take Jennifer’s advice and start documenting my day. Even though I will have a visible schedule, it will be important to write down all that I am accomplishing in a day when I am not in a classroom. The conversations, the planning both short and long-term and the gathering of resources. I want anyone who asks to see how valuable my position is to the literacy reform of the school. To quickly see that even though my day is more flexible, it is full. In doing all of these things as my next steps, in this new position in a new school, I am hoping that my day is transparent, people see my worth and are excited and able to trust me to help them grow as literacy leaders themselves. I am hoping that this will calm my anxieties and the questions running through my head (and my husband’s as well). So, what did I do today? Sit back and get comfortable, I’ve got a lot to tell you! Author literacychatsPosted on August 17, 2017 August 19, 2017 Categories Coaching, Communication, Community, Lesson Plans, Literacy, preparing, Reflection, Teaching, WritingTags Becoming a Literacy Leader, Jennifer Allen2 Comments on What Did You Do Today? Technology in schools is a neutral resource. It does not harm or help student learning when put into classrooms. Only when technology is employed by the teacher to serve as part of the learning experience does it have any impact, positive or otherwise. It’s like saying pencils and textbooks can hinder a math lesson. These are tools and little more. I bring this up because the debate about the promise and perils of technology in schools continues to float around online. In a recent post, Diane Ravitch highlights the commentary from OECD’s Andreas Schleicher, director of the international standardized test PISA. Schleicher agrees with a retiring principal in Australia who stated that mobile technology should not be in classrooms because it is a distraction. The reality is that technology is doing more harm than good in our schools today. John Vallance, the principal of one of Sydney’s most expensive private schools, Sydney Grammar, said that laptops were not necessary in class and that more traditional teaching methods were more effective. In response, technologists argue their positions with gusto. The point: How can students take advantage of the vast knowledge available at their fingertips without each of them having access to the connectivity that wireless and mobile devices can bring? Blended learning, flipped learning, and BYOD (Bring Your Own Device) are a few of the pedagogical approaches that are often referenced as powerful practices which rely on technology to facilitate learning. My belief is they are both right, and probably both wrong. This happens when we take an extreme view with this very complex issue. Technology can be a distraction and hinder student learning if used mindlessly, such as allowing students to use their mobile devices at any time during the school day. At the same time, there are certain learning accommodations that only technology can provide. Below are two examples from our own school that aptly make this point, within the discipline of writing. We are not a 1:1 school, and probably won’t be for time unseen. We primarily use iPads at the K-2 level and Chromebooks at grades 3-5, although the purpose for a lesson might demand a different device. A 1st grade student hates to write, specifically putting words down on paper physically. The teacher and special education aide use the voice dictation software on an iPad and allow her to speak her words. The application transcribed her language. She wrote an informative paragraph about a topic of her interest. A 5th grade student, who also receives special education services, was writing a fictional story on a Chromebook. I asked him if he prefers typing or handwriting his narratives. “Typing – if I make a mistake, I can go back and change it.” He also utilizes the research, definition, and grammar check tools with Google Docs. Given these specific examples, would Schleicher still argue that technology hinders learning? Our 1st and 5th grader would not be the writers they are without it. Can educational technology maximalists make the claim that every students needs access to mobile devices at any time? Classrooms in our school probably utilize these mobile devices around 25% of the time, to allow for classroom dialogue and group work. Studies have shown that the physical presence of a mobile device can erode the depth of conversations. And it is in our conversations about the role of technology in education where we will find consensus about better use of these tools for learning. Black and white thinking only serves to widen the gap of our collective understanding about this issue. Where are you on this topic? Please share in the comments and continue this conversation. The following passage is my most recent post I shared in our Goodreads community, School Leaders as Readers. This fall we are reading Mindfulness by Ellen Langer. If you are a school leader, I encourage you to join the group. Have truer words ever been written? This is the one of the biggest problems with standards, Common Core or otherwise. They become the product in themselves, instead of a general focus for teaching and learning. Forgive my football analogy, but standards should serve as the yard markers, not the end zone. I was watching a video today on the Teaching Channel. The teacher had “buckets” on the wall, paint cans that had labels detailing a few words which culminated high school literacy standards. 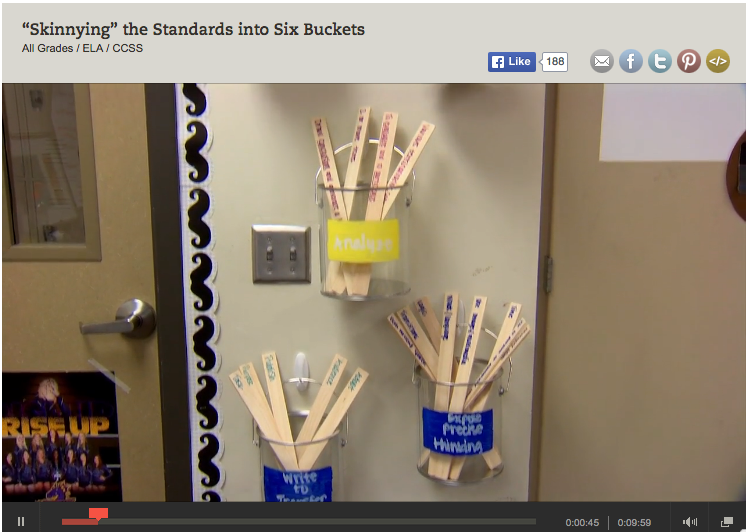 In each bucket were specific skills written on paint sticks related to each standard. The teacher would pull sticks, and this is what the students would focus on that day. I almost sent this out to my teachers – mindlessly! – but caught myself. Thankfully I asked, “Is this what students come to school for? To master standards?” Of course not! They come to learn about great ideas, great thinkers, about our history up until now. Sometimes I think they come to get away from all of the connectivity too. Yes, students should also develop certain competencies, but not removed from the context of these big ideas and know-hows. Langer emphasizes on page 36 that we need to retrain our focus, and that of our students, to asking “How do I do it?” instead of “Can I do it?”. This can best happen in the context of authentic and relevant learning activities. What are your thoughts?